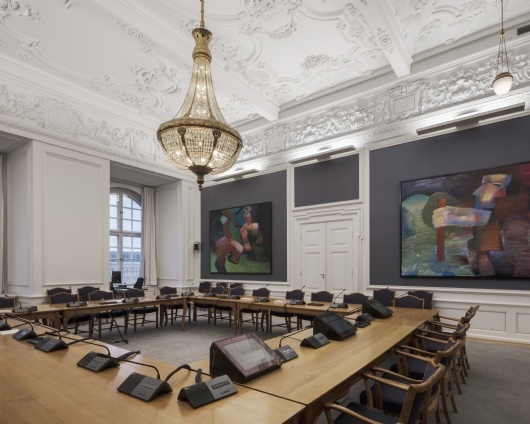 The Folketing – or in Danish “Folketinget” – means “the matter of the people” and is the name of the Danish parliament. 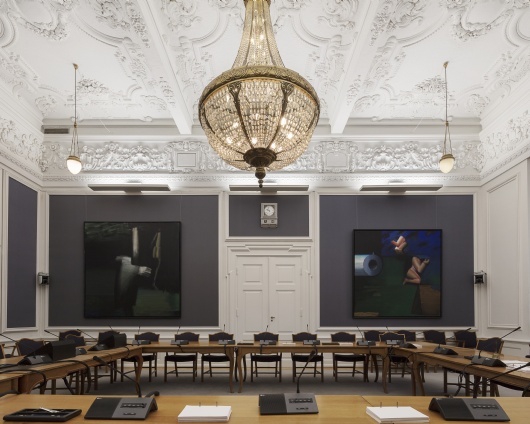 Along with the Supreme Court and the Danish prime minister’s office, the Folketing is housed in Christiansborg Castle in downtown Copenhagen. Parliament has its own television channel on which citizens can watch sessions live or recorded. Up until recently, the broadcasts from Room S092, where the Legal Committee meets, were simply too dark. For good moving images, the lavish chandelier and the four hanging lamps needed a boost. For the solution of the lighting problem for the small hall, ewo took on all steps of the project: from the first sketches on the lighting design to the construction and production of a luminaire housing to the final installation and ultimate review measurements. 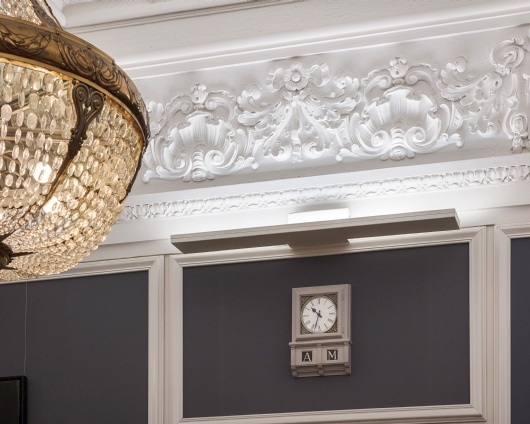 Six panels that point upward evenly illuminate the stucco ceiling. The special model accommodates several lighting units of the LP33 type in two rows, closer to the wall in the lighting color 3,000 K and further away with the “colder” 5,000 K. The indirect lighting establishes the venerable character of the small hall – both for those who are meeting in it and for the extended public, which receives the two-dimensional image. The positive reports from the architects who were involved, the building management, and the television producers all also confirm that the ewoIndividual solution that was developed here has completely met the different expectations: the product only extends a few centimeters into the space, and the surface that is attached to the wall has been reduced to a minimum. Within that context, the lighting is extremely effective. At specific critical positions, the brightness can be increased from 50-80 lux to the 600-1,000 range. The right lighting technology makes it possible for this channel of communication to reach the citizens without it intruding upon the character of the room.